Only four years after achieving statehood, Washington was caught up in one of the worst economic collapses in U.S. history. The ‘90s were hard times in Seattle and Washington. In his new book, “The Panic of 1893: The Untold Story of the State’s First Depression,” retired Seattle Times editorial columnist and veteran business journalist Bruce Ramsey details how the last economic contraction of the 19th century shattered the new state. It’s an important piece of context as we’re revisiting the 10th anniversary of the Great Recession. Although that more recent event brought the world to the brink of a second Great Depression, Seattle fared relatively well and kicked off one of its biggest, gaudiest booms ever. Thousands of newcomers to the Puget Sound region don’t realize that this is a bust and boom place. And some of the busts have been staggering. The 1893 collapse began in Argentina, with contagion to London banks and a European run on U.S. gold reserves. America was on the gold standard, where dollars could be redeemed in the precious metal. The United States then was what today we would call an emerging market. Much of its growth was being financed by foreign investors, especially from Britain. When they pulled out, the effects were devastating. Nationally, hundreds of banks closed, dozens of railroads were forced into receivership — including the Northern Pacific, backbone of the Northwest — and unemployment shot up, perhaps as high as 19 percent. That’s nearly as severe as the estimated 25 percent in the trough of the Great Depression. (By comparison, the unemployment rate peaked at 10 percent nationally in the recent Great Recession). “In the Evergreen State, editorial pages dismiss the distant market crash as a flurry,” Ramsey writes of 1893. In fact, it was a blizzard and soon hit the extraction and agricultural sectors that were Washington’s mainstays. Prices for wheat and lumber collapsed. Those lucky enough to keep their jobs saw their wages cut. Ambitious industrial projects died, including the Great Western Iron & Steel mill planned for the eastern shore of Lake Washington. Many promising towns were severely wounded. Booming Port Townsend never regained its former power. Tacoma’s failure to become the premier city of the Puget Sound region owes much to the depression that dragged through 1897. Tacoma, Port Angeles, Port Townsend, Everett and Spokane were among the places worst hammered by bank failures. Ethnic animosity exploded. For example, Tacoma voted to ban all Chinese from city jobs. Chinese immigrants were expelled from the city. Washington’s unemployed contributed “soldiers” to Coxey’s Army, the 1894 protest march on Washington, D.C. In Washington state, labor agitation and demands for reform — by violent means if necessary — were ubiquitous. Compared with 2008 and its aftermath, these were true hard times. In the 1890s, the United States had no Federal Reserve to act as a lender of last resort to stabilize the economy. It had no social-safety net. Charities provided aid (but were quickly overwhelmed). The era offered no federal insurance on bank deposits, no regulators to guard against fraud. Courts were extremely conservative and pro-business. The federal government was small. Interestingly, this is much like the ideal arrangement that some Republicans seek when they aim at repealing the New Deal and Great Society safety-net programs and the Nixon-era environmental laws. Many want to severely constrain the Fed and even return to the gold standard. “The Americans of the 1890s accepted losses and suffering people would not today,” Ramsey writes. But they wouldn’t do so forever. 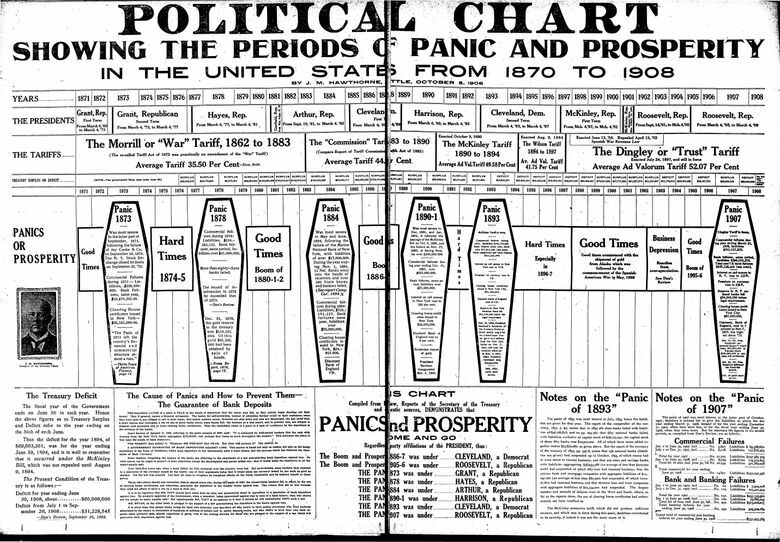 The bad times of the 1890s gave birth to a potent populism, including a left-wing Populist Party. William Jennings Bryan, campaigning against moneyed interests and eastern “elites,” won the Democratic presidential nomination in 1896. There he delivered his famed “Cross of Gold” speech against the prevailing monetary policy. It’s a question many voters are still asking about both political parties. But Bryan lost, not least because voters were angry with the Democrat in the White House, Grover Cleveland. Republican William McKinley ran a shrewd campaign from his front porch, backed by big money. The Democrats were (surprise!) divided. Bryan did win Washington’s four Electoral College votes that year. Yet popular discontent with Gilded Age laissez-faire policies continued. And the nation was undergoing historic changes. The Industrial Revolution reached new heights in technological advance and economic influence. In 1890, the Census Bureau declared the frontier closed, meaning the areas of the nation considered unsettled were gone. Union organizers were undeterred by bloody suppressions. Farmers were angry over the pricing power that railroads had when their crops needed to be shipped to market. The hard times of the 1890s helped kill the Gilded Age as the political system absorbed popular pressure and turned it into policies that avoided revolution and protected capitalism while also enacting real change. The major institutions and arrangements we now take for granted were first instituted by Republican President Theodore Roosevelt, then Democratic Presidents Woodrow Wilson and Franklin Roosevelt (TR’s cousin) in the first three decades of the 20th century. These include the Federal Reserve, a progressive income tax, trust busting, the Securities and Exchange Commission, legal protections for unions, regulation of financial institutions, deposit insurance and federal spending to offset lost demand in a downturn. States enacted more enlightened policies, too. From the Fed to unemployment insurance, these reforms had our back 10 years ago when the financial collapse froze the banking system and caused a severe contraction. Imperfectly, yes. But the situation could have been much worse — 1893 worse.